There’s a lot to like about GreenGeeks. The EcoSite shared plan includes numerous unlimited features. The cPanel is equipped with both the Softaculous and the Fantastico applications installers. Many hosts offer a free domain name for the first year only, they include one for the life of the account. 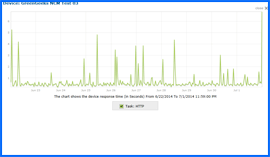 Further, GreenGeeks recorded 100% uptime and faster than average server speeds during testing. Although their phone support has limited hours, chat and e-mail support is 24×7. GreenGeeks is affordably priced at $7.95 for a 1-year term renewal, and the first year costs only $6.36 per month with the coupon code above. GreenGeeks has earned the NCM Online designation of RECOMMENDED. We hear a lot about “green” companies these days. While a small carbon footprint is certainly a positive, the ultimate test of a web hosting company is their ability to deliver a high quality service at an affordable price. We are pleased to report that GreenGeeks delivers on both counts. GreenGeeks offers a single shared hosting plan — EcoSite. It includes more unlimited features than any other entry-level plan we have reviewed to date. Disk space, bandwidth, domains hosted, e-mail accounts, e-mail forwards, autoresponders, parked domains, subdomains, FTP accounts, and MySQL databases are all unlimited. GreenGeeks separates itself from the crowd in other ways as well. While many hosting companies will provide a free domain name for the first year of hosting, GreenGeeks includes a free domain name for the life of the account. Further, their cPanel control panel (see screenshot below right) includes both the Fantastico Deluxe and the Softaculous apps installers. As far as we can determine, this is an industry first, which we have not encountered with any other hosting company. 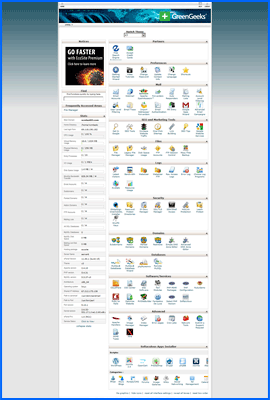 Screenshot of GreenGeeks cPanel control panel. It provides both the Softaculous and the Fantastico Deluxe applications installers. Click to enlarge. In addition to shared hosting, GreenGeeks provides reseller hosting plans starting at $19.95 per month, VPS (virtual private server) plans that start at $39.95 per month, and dedicated server plans that start at $169.00 per month. GreenGeeks’ EcoSite plan is scalable and ecommerce ready. It includes the Agora, CubeCart, PrestaShop, OpenCart, Zen Cart, and OS Commerce shopping carts, as well as the Magento and other ecommerce platforms. SSL certificates are available for only $20.00 per year ($1.67 per month), and dedicated IP addresses are only $30.00 per year ($2.50 per month). In addition to WordPress, available content management systems and development platforms include Drupal, Joomla, PHP-Fusion, Concrete5, CMS Made Simple, MODx, Xoops, Zikula, e107, Website Baker, PHP-Nuke, Open Real Estate, ocPortal, Pligg, PyroCMS, Subrion, Mambo, Contao, Geeklog, SilverStripe, Typo3, sNews, jCore, ImpressPages, ImpressCMS, phpwcms, Silex, Monstra, and others. Telephone support is provided Monday to Friday from 9:00AM EST to Midnight EST; Saturday and Sunday from 9:00AM EST to 8:00PM EST. Chat and e-mail support are provided 24x7x365. All support technicians are based in North America. GreenGeeks is “B” rated by the Better Business Bureau; while the EcoSite plan is backed by a 30-day, money-back guarantee. 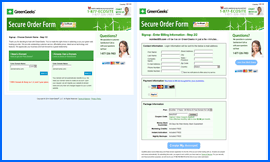 GreenGeeks’ simple, 2-step order process screenshots. Click to enlarge. GreenGeeks makes buying hosting quick and easy. Their 2-step check out process is a model of simplicity (see screenshot right). In Step 1, you simply enter a new domain name (provided free) or an existing domain name. In Step 2 you enter billing information; select a payment method and hosting term (monthly, 1-year, 2-year, or 3-year); click the “Create My Account!” button; and you are done. There is no attempt to trick you into purchasing a more expensive plan or additional-cost options. For purposes of testing and reviewing, we selected the 1-year payment term to avoid paying the $15.00 (ouch) monthly-term set-up fee. We used the PayPal payment option and checked out. GreenGeeks Uptime Test Results Chart. Click to enlarge. Less than two minutes later we received our PayPal receipt and the “Order Confirmation” e-mail. Fifteen minutes later, the “Account Manager Login Details” e-mail arrived. It included our new account dashboard login information. The GreenGeeks account dashboard provides an account overview, access to billing information, domain management, and the cPanel. Six minutes later we received the “New Account Information” e-mail. It provided an account overview, control panel and FTP login, nameservers information, e-mail settings, and more. Less than one-half hour after placing our order, we had everything we needed to set up our test site quickly. Next, we proceeded to set up Dotcom Monitor reliability and server speed testing. All web hosting services reviewed by NCM Online are subjected to 10-day uptime and page-load speed testing. Beginning on 6/22/14 and concluding on 7/1/14, our GreenGeeks-hosted website was checked for uptime and page-load speed every fifteen minutes. Nearly 2,000 individual checks spread across 13 worldwide locations (7 U.S., 6 international) were performed during the 10-day test period. GreenGeeks Speed Test Results Chart. Click to enlarge. The uptime testing included 954 separate server reliability checks during the course of the 10-day test. We are pleased to report that unlike so many lesser services, GreenGeeks compiled a perfect 100% uptime score (see uptime test chart above right). Page-load speeds proved to be faster than the norm. The 947 server speed checks performed from the 13 worldwide locations produced a 1.4226 second page-load speed average (see speed test results screenshot right). 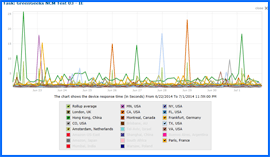 The 512 server speed checks performed from the 7 U.S. locations produced a 1.0464 second page-load speed average. GreenGeeks proved to be a pleasant surprise. Their fully-featured and easy-to-use EcoSite plan is scalable, reasonably priced, perfect for beginners or experienced webmasters, and provides high quality web hosting that merits your consideration. GreenGeeks has earned 4.5 stars and is recommended by NCM Online. Cheap website hosting company price comparisons based on 1-year term list price before coupon/promo codes or limited time/introductory offer discounts. These are the renewal rates for the second year of hosting. To ensure that you receive the most affordable GreenGeeks pricing possible, please visit our Web Hosting Coupon Codes page for current discounts and special offers before making any purchases. GreenGeeks has been an industry leader in quality green energy website hosting since its founding in 2006. The firm puts three times the energy it consumes back into the grid in the form of wind energy. It is headquartered in Los Angeles, California in order to deliver top service to clients based in over 150 countries. The company caters to beginner through professional clients through its varied plans that include shared, VPS, reseller, and dedicated server offerings. Clients receive reliable 99.9% uptime, 24/7 support, and a money-back guarantee for a period of thirty days. The GreenGeeks leadership team represents in excess of 40 years of experience in the field of excellent and cost-effective web site hosting. Customer accounts are supported through the best server hardware, the latest software programs, and the most reliable network providers available. The company comprehends the need of its clients for superlative service and strives daily to meet these service expectations. It has put together comprehensive and affordable solutions to assist clients in getting their web sites online quickly and easily, promoting those sites, and making them profitable. GreenGeeks employs some of the brightest, friendliest and most devoted staff and service and sales technicians in the web hosting business. The California service center offers extended hours for both live web chat and phone assistance, as well as an email contact system available 24/7. The team is devoted to customer satisfaction and will labor to resolve all client issues during the first contact. However, if further research is required, customers can expect a prompt reply in regard to their hosting concerns. The firm pulls energy from the grid in order to ensure they have a constant power flow to servers that will prevent service interruptions. GreenGeeks differentiates itself from competitors by acquiring wind energy credits equal to three times the energy it consumes from the grid. Company clients can declare that their websites are 300% green and that they are not just covering their own carbon footprints, but those of others as well. Another way that GreenGeeks furthers its mission of being a leading green company is through reconfiguring its servers to operate more efficiently. The servers use less energy and run at lower temperatures. The lower temperatures in turn mean that less energy is needed to cool the servers. (The huge fans that constantly cool the co-location data facilities require large amounts of energy). The company’s attention to detail results in energy-efficient data centers. GreenGeeks also is on a mission to reduce their offices’ carbon footprints. The company requests that staff only print essential and legal documents and it also engages in a rigorous recycling program. It utilizes automatic electric control systems that turn off lights in empty offices and power down office machines that are not in use. The firm’s commitment to energy conservation is carried out in its daily internal and client support operations. This video tutorial demonstrates the installation of WordPress on an GreenGeeks shared hosting account using the cPanel control panel and the Fantastico Deluxe applications installer.